Stupid Berries, It's Winter and Snowy! After our snow over the weekend, I waited a couple days to go out and take photos. Well, I tried taking photos initially, but at 5 degrees, I didn't last long outside. The next day, everything was still nice and frozen over and nothing had melted, so I tried again. My neighbor, Cathy, always has a great vegetable garden in the summer (and an awesome flower garden too), so I figured I'd wander over there and take some photos of everything dead in the winter. Imagine my surprise though, when I walked up her driveway, glanced at one of her bushes, and noticed these red berries just hanging on for dear life. 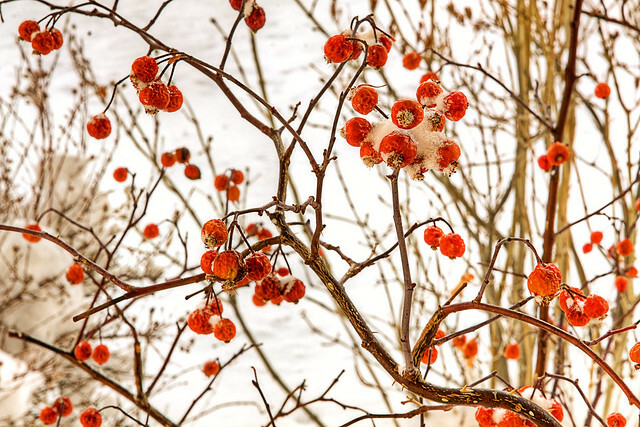 Nothing else was alive in the area, so I snapped a few of the red berries against the stark, white landscape. Also, happy birthday (yesterday) Cathy!